I read this article and found it very interesting, thought it might be something for you. The article is called The Thought Leaders That You Absolutely Must Meet and is located at http://www.gardendish.com/thought-leaders-absolutely-must-meet/. Have you ever been to a party where you didn’t really know anyone? But then the host came to your rescue. She grabbed you by the elbow, steered you through the crowd, and said, “There are so many people here that you absolutely must meet!” Being new to the vegan/plant strong lifestyle can feel like a party of one – until you get to know some of the thought leaders. It’s time for you to meet a handful of them, at least virtually, through the magic of video. Let’s start with Dr. Michael Greger. He’s got a great sense of humor to go along with his great knowledge of nutrition and medicine. He performs an incredible service to the community through his web site, NutritionFacts.org. There, he posts daily videos that highlight the latest, greatest research – explained in terms we can all actually understand. 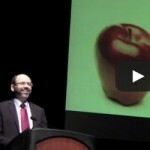 For a big dose of the good doctor, check out his new talk on preventing our most common diseases. Friends saw him give this presentation a few weeks ago, and they’ve been on the plant strong path ever since. Yes, he is that good! Next, say hello to Jeff Novick. If you want to talk to someone with serious and practical knowledge, who shares it with humor and fun, he’s your guy. My first encounter with Jeff was at Vegetarian Summerfest a few years ago. There, he introduced everyone to his approach to reading labels on food. Here’s a quote: “Never believe anything written on the front side of a package.” Here’s Jeff talking about another of his favorite topics, calorie density. If you haven’t already, you need to meet Dr. Neal Barnard. He’s the head, face, and heart of the Physicians Committee for Responsible Medicine (PCRM). Personally, Neal is so kind and soft-spoken, but at the same time, PCRM is a very strong and assertive organization. Their advocacy efforts range across a wide swath of issues, everything from animal testing to school lunch programs – and they really get results! Currently, Dr. Barnard and PCRM are doing some exciting and absolutely crucial work on diet and mental health. Check out his talk on Alzheimer’s and bad fats. Have you read “The China Study” or “Whole”? Colin Campbell is the author of both, and he’s had an astonishing career. He’s studied the relationships between diet, nutrition, and the “diseases of affluence” – cancer in particular. And to do this research, he had to see through and beyond his own upbringing on the family farm, where cows and other animals were part of the everyday landscape. Hear him in this video where he describes the link between animal protein and cancer. When you’re new to any community, it’s helpful to get a sense of its history. Gathered here are some of the real pioneers of the field (and their areas of influence): Nathan Pritikin (longevity), Dr. Denis Burkitt (fiber), and Dr. Roy Swank (multiple sclerosis). Though none of these men are still living, their work continues. For a great perspective on diet and health, hear them in their own words. Saved the best for last – get to know the incomparable Dr. John McDougall. The learning materials (books, videos, etc.) that he and his wife, Mary, have created are first-rate and incredibly helpful. Even more important, though, are the lives John has touched as a physician, a true healer. His patients actually get well. Through his lifestyle live-in program, vacation trips, and his internist practice before that, he has probably done more to improve the health and well-being of his patients, his friends, than anyone on the planet. Picking just a single video to introduce Dr. McDougall is tough, but here’s a great one. Now that you’ve met a few of the leading lights in whole-food, plant-based nutrition, get in there and mingle! Go to some events and get to know these people personally – and meet some of your peers who are just getting started, too. And then, introduce some of your friends!! Whole Wheat Flour – Which Brand is Best?